All transactions are safe and secure with a reliable history in online purchasing behind each of our associates. Buy the Family Guy Costumes, Peter Griffin Masks, Stewie Costume to own Family Guy clothing and merchandise. 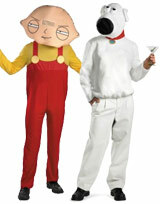 Outfit yourself in a Family Guy Stewie costume or opt for the family's sophisticated canine with a Brian Griffin mask. Whichever you choose, you'll be the hit of your Halloween party. It will also give you an excuse to misbehave and say popular quotes from the TV show like, "Spank me. I've been a bad boy," and "I freakin' love beer." However, wearing the Brian Griffin costume does not give you the excuse to relieve yourself in the yard. In addition to the Family Guy Costumes, Peter Griffin Masks, Stewie Costume above, browse the Family Guy Clothing Gallery for more apparel like men's and women's clothes, kids shirts or hoodies.